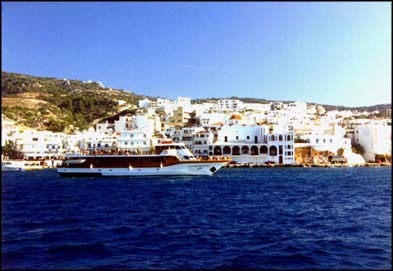 The modern town of Pigadia, the capital of Karpathos, is the center of year-round activity. All government offices are centered here. In the summer, during the tourist season there are numerous daytime and nighttime activities. Many small shops, restaurants and supermarkets operate during the day and evening hours. Many tavernas and clubs operate till about 4 o'clock in the morning. Unfortunately, the town suffers from uncontrolled noise pollution. You can rent cars or motorbikes to roam roads that will lead you to beautiful beaches. Some beaches can be accessed easily but most of the time are deserted. Thus, it's like having your own personal beach on the Aegean Sea. If you drive or if you are walking the narrow streets . . . be extremely careful. Drivers of cars and motorbikes seem to have no regard for pedestrians! The restaurant most worth dining at is "The Life of Angels", offering the most traditional combination of good food, live music, and atmosphere in Pigadia. 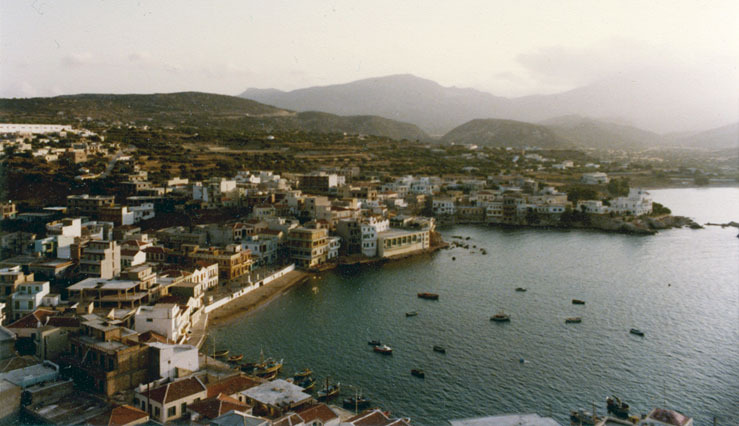 Above is a photo of Pigadia, taken in 1979, when it was still a small village. Notice that there is no road following the coastline in this picture. See our panorama of Pigadia, to see what this town looks like today.